Whether smoked, grilled, steamed or served raw in tartare, salmon can be prepared in a thousand and one ways. We tested dozens of salmon recipes and made a top 3 for you. Check out these scrumptious salmon recipes today and dazzle your guests. Put the shallots with the butter in a pan. Put the salmon fillets when the shallots become translucent, salt slightly. When salmon is cooked, set it aside on a plate. Deglaze the cooked shallots with the balsamic vinegar and add some water. Add the mustard. Simmer 2-3 minutes, then add the cream. Return the salmon patties to the pan just before serving to warm them up. Yum, Yum … Serve with rice or, why not, romanesco! Honey, Garlic, and Salmon- throw them together and you get a delicious meal to devour. Would you ever believe that making salmon could be so simple and effortless? Salmon is probably the most innovative and versatile of all ingredients. The pink flesh stands out brilliantly whether you grill it, pan sear it or broil it. It is very nutritious too. A hundred different ways of cooking salmon are there, but this recipe is the easiest one that you’ll find. It uses minimal ingredients, and all you need is one pan and not more than fifteen minutes of your time. Sometimes, to bring out the authentic flavor of salmon, you need to combine it with sweet and savory flavors. This recipe does just that! Cooking salmon shouldn’t be too time-consuming at all, because it takes so little time to prepare salmon. Usually, the preparation of sauces takes up most of our time. But, things will be completely different when you try this recipe. Let’s keep it simple for a change and enjoy the authentic flavor of salmon without excessive spices and seasoning. After all, how many salmon recipes are there which involve only five ingredients and get ready in less than fifteen minutes? If you get the sauce right, you’ll end up having a great tasting recipe. The best part is that there aren’t any unnecessary steps to make the process complex for you. The salmon is cooked directly in the sauce, so, you don’t need to sear or fry it first. You’ll need to brown the butter, throw in the garlic, soy sauce, and lemon and add the salmon. That’s it! The garlicky sauce and lemon do the real trick here. These ingredients give this recipe the much-needed tinge of tartness. This honey garlic salmon recipe will become your go-to recipe whenever you are short on time and need to put together something delicious. The use of browned butter in honey garlic sauce further enhances the flavor and makes this dish stand out. Apart from helping you simplify the process of cooking salmon, the idea behind cooking it directly in the sauce is to retain maximum nutrition. You’d agree that the more you cook salmon, the lesser nutrients you get. Moreover, as you cook salmon in several steps, it is possible that it fillets fall apart halfway through the process. 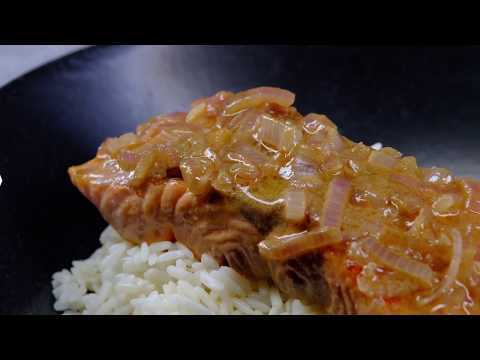 However, this honey garlic salmon is a fool-proof recipe where you won’t face this issue because you cook the salmon straight into the sauce. So, now you won’t need to go through the anxiety-ridden process of frying and flipping salmon. But, how do you get the crisp edges that we usually get with searing salmon? Don’t worry! You’d still get those crispy edges. After salmon is half cooked, you can broil or grill the fillets for a couple of minutes to get that golden, caramelized, and crispy finish. 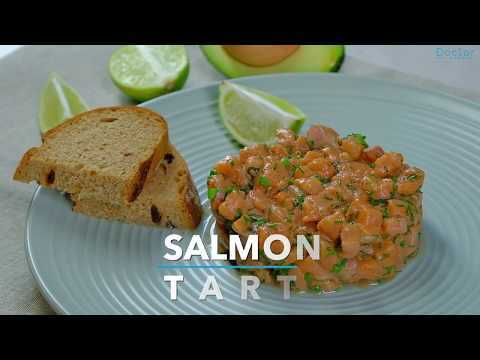 Even if you haven’t got any idea about how to cook salmon or it’s the very first time you’re trying your hands on cooking, this recipe won’t disappoint you. For beginners, it’s the perfect recipe to start their culinary experiments. Just grab some salmon fillets, get the sauce right and you’re free to enjoy the meal. With only a handful of ingredients, most of which you’ll easily find in your pantry as these are everyday use items, this is an amazing recipe. The sauce ingredients butter, honey, and soy sauce might already be sitting in your refrigerator, waiting for your attention. You may choose to add the lemon wedges into the pan while cooking the sauce if you like a stronger lemon flavor. However, add them while the sauce is bubbling not early on. Adding the peel gives the dish a lemony flavor while leaving them out gives it a milder tartness. So, what’re you thinking? 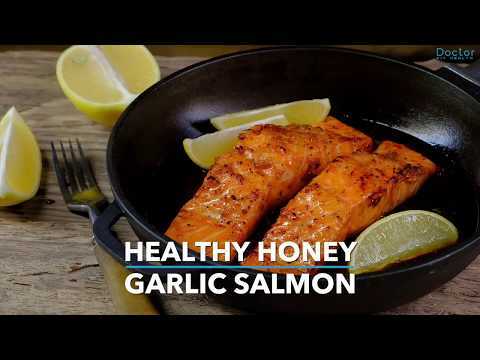 Get the ingredients ready to prepare this honey salmon garlic recipe for dinner tonight! Cut with a knife the salmon into small cubes and put in a salad bowl. Add balsamic vinegar, olive oil, chopped chives, dill cut, lime juice, and 1/2 lemon juice; and mix everything. Shape using a cookie cutter. Let it stand for 1 hour in the fridge, and serve chilled. So good! Salmon is my all-time favorite fish!! So flavorful!!! Absolutely great job! I did enjoy the blog. I can do this. Really specific and amazing videos you shared. Thanks for sharing these yummy, delicious recipes! I love salmon too, my favorite recipe is the honey garlic salmon, I highly recommend it! The 2 others are also really tasty! Some great suggestions on how to cook salmon! I always find myself turning back to the same one or two recipes with it, mainly because I’m not that adventurous with fish. But what I like about your recipes is that there’s a nice bit of variety in the ingredients, and that they all look so easy to make. Salmon is a staple of my diet. I try not to eat too much, but once or twice a week is common for me. I’m a fan of lemon pepper seasoning, but I am just going to have to try one of these. The salmon with shallots sounds particularly tasty. Just 25 minutes from prep to table? You really cannot beat that. I wonder what else I could replace shallots with for future dishes?